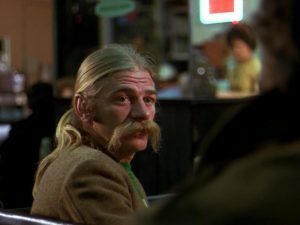 The great actor Seymour Cassel has passed on. I knew him for a long time, we first met when I was editing a film called Mobsters and Seymour played a priest. He was very angry with Chris Penn because Penn had kissed him on the mouth in a scene without telling Seymour he was going to. “You don’t do that to an actor!” I remember him saying. Anyway Seymour was in a lot of films, a whole lot. I was working with Quentin Tarantino and he gave me a copy of a film called Black Oak Conspiracy. Quentin liked this film, I watched it and there was Seymour. Not only is he in it , he’s the hero of the film, he saves the leading man at the end. A while later I was at Trader Vic’s with Seymour and I told him I had seen Black Oak Conspiracy and that he was the hero of the dammed film. He wanted to see it again.I don’t think he had seen it since he acted in it. I looked and looked but couldn’t find the copy of the film. Time passed, I never found it to give to him and I feel bad about that. Now he’s gone but everyone else can see Seymour the hero on YouTube. Here is a great look at what went on during the making of Stanley Kubrick’s The Shining. His daughter Vivian had unlimited access and we are lucky that she did. We get to see the master at work. Check it out.